The use of stained glass in large quantities in ecclesiastical buildings began early in the twelfth century and spread rapidly over Western Europe. The sacred scenes thus portrayed provided an invaluable teaching aid, communicating great stories of the Bible to an unlettered population. At the same time the authority of princes and territorial magnates was conveyed to their subjects by means of heraldic glass in churches, at first by the use of symbols and devices in the borders surrounding the lights; then by shields of arms occupying a whole portion of the window — usually in the tracery lights or canopies above the figure panels — eventually by embodying the complete heraldic achievement, including crest, mantling and supporters. On the Continent heraldic glass appeared quite early in the thirteenth century. There are some magnificent examples still in existence, those in the Cathedral of Chartres probably the best known. It came to Britain somewhat later. The earliest English heraldic glass, dated about 1260-70, is found in the West Window of Salisbury Cathedral, and there are three shields of this period in the apse of Westminster Abbey. 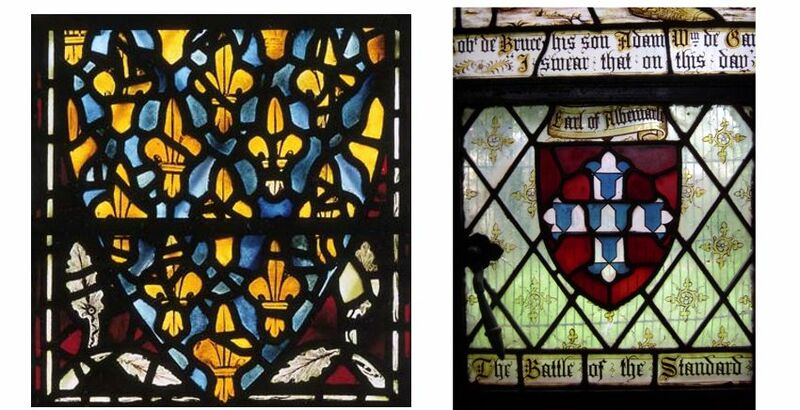 By the fourteenth century heraldry was becoming fashionable in churches, at first usually placed against grisaille in the lowest layer of the window, later in the tracery lights. The arms in these latter examples were very often Royal Arms, especially after 1340 when the French lilies were combined with the English lions in token of Edward III’s assumption of the title of King of France. Towards the end of this century the technique of ‘abrading’ the ‘flashed’ glass was developed. ‘Flashing’ was the process of immersing plain blown glass into molten coloured glass, as often as was necessary to obtain a lighter or deeper shade. By ‘abrading’, or scraping off, a portion of this applied colour designs, in plain glass, could be made which could then be stained a separate colour. 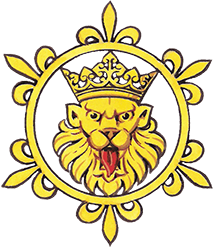 This made complicated heraldic charges, such as the golden lions, much easier to portray, and more elaborate shields could thus be displayed. Although this could easily be done with red flashed glass, it was some time before it was found possible to abrade blue glass. For this reason one frequently sees, in the quartered arms of Edward III, that the ‘England’ quarters have been abraded, while the French fleur de lys have been enamelled on to separate quarries, giving a trellised effect. In churches throughout the length and breadth of England, heraldic Recorders soon learn to recognise the arms of the great Mediaeval magnates whose territorial honours were spread countrywide: Warenne, Clare, Mortimer, Despencer, Bohun, Valence, Beauchamp, Percy, Neville, Berkeley, Fitzalan et al. At a later period the arms of lesser gentry appear in many a village church, sometimes in conjunction with pictures of their owners who donated the windows or even built the church. Without their arms, they probably feared that they would be unrecognisable! They are usually found at the base of the light, kneeling to Christ, the Blessed Virgin or their patron saint. Vast quantities of Mediaeval glass fell victim to iconoclasts during the Reformation, the Dissolution of the Monasteries and the Puritan Rebellion. Some was saved and re-appears in stately homes or later buildings. Heraldic glass, however, was not so likely to be destroyed as the religious pictorial kind; in fact, the movement against the portrayal of sacred figures tended to boost the production of heraldry. The sad fact is that by far the greatest loss of old glass has been caused by simple neglect or poverty; the leading has rotted, or the stonework has crumbled away, allowing the glass to fall out and be lost. Most church glass is now of more recent manufacture; eighteenth century, which is usually very poor work, or nineteenth century design or restoration, the latter half of the century producing some extremely fine examples. It is well worth consulting the printed volumes of the Heralds’ Visitations of a county to find old examples of glass in church windows that is now no more. In the sixteenth and seventeenth centuries the heralds were commissioned to visit the gentry of each county to enquire into their coats of arms and they were encouraged also to visit the churches on their rounds and note the heraldry in the memorials and windows. Not all Visitations have been published; if you wish to consult the church notes in an unpublished manuscript you can enquire of the College of Arms, but there will of course be a charge. Just as with heraldic memorials in wood or stone, the Recorder must beware of being misled by mistakes, either in an original window or in one that has been wrongly restored. Quarries are sometimes replaced in the wrong order after taking down for cleaning or repair, with hilarious results. But original designs are sometimes wrong; the owner himself, or his surviving relative, may not have been too sure of his correct armorial bearings. The wrong colour has been used, simply because the correct glass was not available. Small charges have defied the skill of the artist and he has found it easier to make them larger, or leave them out altogether. With clear glass the enamel paint sometimes decays, producing a different colour, or the outer skin of a piece of ‘flashed’ glass has dropped off, leaving a clear space. Always use a pair of binoculars for the high pieces — or better still, get up there if you can, to see them at close quarters. They often look quite different from down below!